RACHA YAI ISLAND, Thailand, Apr 6 (IPS) - On a beach alive with tropical delights as smooth white sand washed by calm turquoise waters, an European like Bas Toeter cuts an odd figure in a T-shirt, shorts and wide-brimmed hat. Instead of lounging on the beach or swimming in the sea as is the case with a few dozen tourists, the lanky Toeter sweats under the afternoon sun in the company of other foreigners with work on their minds. The product of their labour is gathered nearby: large balls, with holes in them, made out of a mixture that includes cement. At a distance, they come across like giant grey mushrooms strewn, somewhat out of place, on the beach. 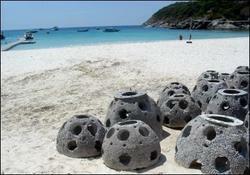 Toeter, a 30-year-old educationist from Amsterdam, has been making these reef balls, as they are known, for almost a week on Racha Yai Island, some 40 kilometers west from Thailand's Andaman coastline. So have the other men and women, such as Mitch Carl and Melissa Keyes from the United States, who are among a group of 25 volunteers from 13 different countries on mission to this island to help restore its coral reefs after last December's tsunami. According to John Walch, one of the leaders in this effort, the almost one meter high balls have helped create man-made coral reefs across the seas. They include artificial successes in countries with renowned natural coral reefs, such as the Maldive Islands, and in tourist resorts like Cancun, in Mexico, and the Bahamas, both washed by the Caribbean Sea. ''Within 15 minutes of reef balls being placed in the sea, fish move in and new corals spawn in a year,'' says Walch, whose organisation, the Reef Ball Foundation, is at the forefront of this effort to enrich marine life around Racha Yai Island. The U.S.-based non-governmental foundation demonstrates just how rich such new sea life would be on its website. A photo displays the fresh coral that radiates with a diversity of shapes and colours over a hardly visible reef ball. Walch's team of foreign volunteers plan to churn out 300 reef balls within the space of a month, thus adding to the half a million such balls that have been placed on the seabed across the world. The Thai government - including Prime Minister Thaksin Shinawatra - is backing this effort in a show of welcoming foreign volunteers who are prepared to help Thailand's tsunami-battered Andaman coastline recover. The government's marine life experts admit that the move to create artificial reefs off Racha Yai Island will be mirrored in other spots near the popular tourist resort island of Phuket. The coastal waters off Patong Bay on Phuket and the nearby Phi Phi island are among them. But 100 days since the devastating Dec. 26 tsunami struck, the exquisite marine life that is a huge tourist attraction here is fortunately not in peril. Only 13 percent of coral was badly affected in the tsunami-ravaged coastal belt, says Niphon Phongsuwan, a senior marine biologist at the Department of Marine and Coastal Resources. Among the areas hit were coral reefs near the Surin, Phi Phi and Similan islands, most of which are a draw among divers for their spectacular coral gardens protected in national marine parks. But Niphon admits that some of the damage to the reefs arose from bad planning of the resort areas along Thailand's south-western coast. ''We have to accept that we developed in the wrong way. In some places land reclamation was a factor that affected the coral reefs,'' he said. Excessive diving has chipped away at the underwater beauty, largely due to damages caused by boats anchoring in the midst of a coral reef or divers stepping on the coral. According to available estimates, the island of Phuket attracts between four to five million tourists annually. Among them are nearly 100,000 visitors who go snorkeling or diving at the many coral reefs nearby. But today, there is barely a trace of such a large number of divers plunging into the water to take in the beauty of Thailand's exquisite marine life. Naokorn Amornwatpong, a Thai marine tour operator, attributes this absence to the fear caused by the tsunami and the damage on the shore, than the loss of coral life in the sea. By then, the beauty of Thailand's natural coral reefs in the Andaman Sea will go up against the fledgling man-made reefs, whose makers feel confident will be a sort after alternative to diving enthusiasts. But will they be as pretty as nature's offering? Copying nature, one artificial reef at a time. RAJA ISLAND, Thailand, (AFP) - Every day for weeks, American John Walch has made quirky cement balls he is convinced will sprout to life once when they are dumped this month into Thailand's coastal waters. The project is not pollution, it's a form of environmental protection, rehabilitation and, ultimately preservation of part of Thailand's spectacular natural heritage that was bruised in the December 26 tsunami. Thailand's lush marine paradise lures millions of tourists annually with its gorgeous coral treasures, but it's aiming to improve on nature's bounty by planting artificial reefs along the Andaman coast. The kingdom's coral has earned global renown, but as tourism has boomed in recent years, the natural reefs are under threat as many visitors take advantage of Thailand's cheap and easy access to world-class dive sites. "There is too much diving, the number of people visiting each particular dive site has exceeded the limit," conservationist Phitul Panchaiyaphum of the department of marine and coastal resources explained on a boat to Raja island off the southern tip of Phuket. In addition to pollution such as plastic bags and fishing lines and nets, reefs have suffered from dive boats dropping anchor directly onto sensitive coral areas, he said. Divers themselves sometimes touch, break off or step on the reefs. "We need to create more diving destinations," he told reporters. "We are installing artificial reefs -- concrete cubes or balls where fish will reside and coral can grow." Enter Walch and his non-profit Reef Ball Foundation. The group has put half a million of the cement structures into the sea in 50 countries. At the request of a resort hotel under construction on Raja island, Reef Ball began preparing a Thai project in September. Three months later disaster struck, with the tsunami barreling into the coast. A January assessment of the region's coral found 13 percent of reefs showed "high impact" from the waves -- either broken or upturned coral, reefs smothered by sand, or damaged by debris swept into the sea by the huge waves. "We're all here to help this bay recover after the tsunami," Walch, 56, said alongside a cement mixer set up at the site of the future hotel dominating Raja's beach. Over the next month Walch and his team of international volunteers plan to place 300 reefballs in the bay, creating five new reefs and one snorkel trail to sit alongside the bay's lone natural reef. "It will provide new reefs for the increased number of tourists coming into this bay," he said, nodding at the handful of visitors snorkeling out in the bay's turquoise waters. "You only have so many natural reefs to go to. This will help lessen the pressure by giving alternatives." Similar artificial reefs are planned for Kata, Patong and Kamala bays on Phuket, and on the island of Phi Phi, famed for its coral formations. The projects have the backing of the prime minister's office, the Tourism Authority of Thailand and the ministry of environment, all of which are eager to find ways to ease mounting pressure on the kingdom's ecosystem. Though they look crude to they eye, the meter-wide reef balls, patented by the foundation, are actually quite technical. They are designed so that when water passes through its many holes, a vortex is created that pushes the ball down, ensuring stability. Four reef balls had already been set in place in the bay as a demonstration before the tsunami. All of them stayed put. The balls, Walch said, are quick to become hosts of flourishing coral systems, with fish claiming them as their new homes barely a quarter hour after its placement on the sea floor. "Within three years, reef balls have 75 percent of the marine organisms that inhabit a normal reef," he said. Pieces of coral broken off by the tsunami that would die if left unattended are attached to the balls where they grow anew. Not everyone is a reef ball fan, though, with some wondering if overextension of the projects will backfire with tourists who come to Thailand for the genuine article. "This is a way to decrease pressure on coral reefs ... but I don't see the point of reef balls in the natural reef," said Niphon Phongsuwan, a senior biologist at the department of marine and coastal resources, who put the number of divers and snorkelers visiting Phuket at about 100,000 per year. "For the first 10 years they might look ugly." Walch, who has worked on artificial reefs for three decades, said they'll look splendid after only a few years, but conceded the true treasures of the sea belonged to nature. "We can never replace what mother nature has done," he said, "but we can try and replicate it as good as we can."